40" 1080P LED TV with Built-In DVD PlayerThis high definition LED TV features a beautiful crystal clear display and the 3 HDMI Inputs support sources up to 1080p. An HDTV Tuner is built in allowing for high definition over-the-air digital playback. The built-in DVD player allows for DVD, CD, and photograph CD playback while saving you space. You will have one less remote to worry about as the included Full-Function Remote controls both the television and the built-in DVD player. Experience the best in entertainment with MirageVision outdoor TVs built by experts. This MirageVision Gold Series 70-inch HD television features an LED enhanced back-lit screen for increased brightness outdoors and one of the highest dynamic contrast ratios (8,000,000:1) on the market. This HDTV features crisp, 1080p resolution, and an active matrix liquid crystal display for enhanced brightness. Ambient light technology automatically adjusts the image to adapt to changes in outdoor lighting conditions. All MirageVision televisions are top name-brand TVs, such as Vizio, Sharp, and Panasonic, that are customized to suit outdoor weather and temperatures. The TV will withstand sub-freezing weather and temperatures up to 145 degrees Fahrenheit. A special Teflon UV-coat is applied to the sealed enclosure to protect the moisture-resistant internal circuitry from dust and bugs, while the adjustable, water-proof nylon cover protects inputs and outputs. Rear cabinet RainGuard technology allows internal hot air to escape, while repelling rain or snow to prolong the life of your TV. This all-weather TV comes complete with a remote, tabletop stand, and back panel wall mount holes. Each MirageVision TV is custom-altered for the outdoors and appearance may vary from what is pictured. The manufacturer requires the use of a surge protector with their products for the warranty to remain valid. 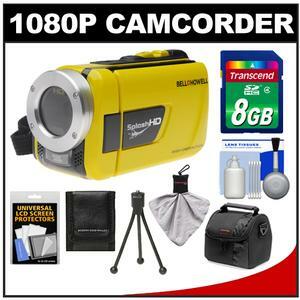 The Bell & Howell Splash HD WV30 Waterproof Camcorder will simply amaze. It is waterproof to 10 feet and equipped with a 3-inch LCD display in a compact hand-held design that you can take anywhere. 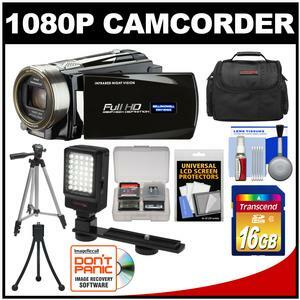 In addition to its superb 1080p High Definition video capability it features 16 MP resolution for digital still pictures. The HD WV30 also features an 8x digital zoom an SD card slot (expandable up to 32GB) USB 2.0 interface built-in LED light and HDMI port capable of 1080p HD output. Includes carrying case. This TV stand that can accommodate LCD and plasma televisions up to 40 is designed to be placed in a corner to help you make the most of your space (please be sure to measure your TV s dimensions). Metal handles with a silver finish. Designed to be placed in a corner to help you make the most of your space. Accommodate LCD and plasma televisions up to 40. Three storage compartments perfect for living room electronics (e.g. satellite receiver DVD player video game console). 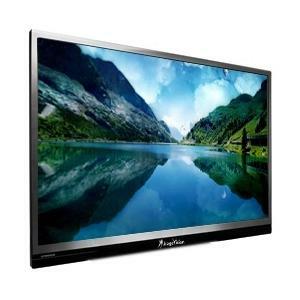 Product Dimensions: 19.25 W x 47.25 D x 18.75 H.
Shipping Dimensions: 23 W x 53 D x 7.25 H.
24" LED HDTVThis ProScan 24" LED HDTV features a 24" widescreen panel with full 1080P resolution for optimal viewing. Inputs include HDMI, component and composite video, as well as VGA for computer connection and USB for displaying pictures or playing MP3 files. Experience the best in entertainment with MirageVision outdoor TVs built by experts. This MirageVision Gold Series 60-inch HD television features an LED enhanced back-lit screen for increased brightness outdoors and one of the highest dynamic contrast ratios (6,500,000:1) on the market. This HDTV features crisp, 1080p resolution, and an active matrix liquid crystal display for enhanced brightness. Ambient light technology automatically adjusts the image to adapt to changes in outdoor lighting conditions. All MirageVision televisions are top name-brand TVs, such as Vizio, Sharp, and Panasonic, that are customized to suit outdoor weather and temperatures. The TV will withstand sub-freezing weather and temperatures up to 145 degrees Fahrenheit. A special Teflon UV-coat is applied to the sealed enclosure to protect the moisture-resistant internal circuitry from dust and bugs, while the adjustable, water-proof nylon cover protects inputs and outputs. Rear cabinet RainGuard technology allows internal hot air to escape, while repelling rain or snow to prolong the life of your TV. This all-weather TV comes complete with a remote, tabletop stand, and back panel wall mount holes. Each MirageVision TV is custom-altered for the outdoors and appearance may vary from what is pictured. The manufacturer requires the use of a surge protector with their products for the warranty to remain valid. The Bell & Howell DNV16HDZ is an affordable high definition camcorder that records up to 20 hours of video to removable SD/SDHC memory cards (20 hours per 32GB card). The DNV16HDZ HD features a 16.0 MP resolution built-in digital camera 10x optical zoom slow motion playback and much more. Other useful features like the 3.0 Touch Widescreen LCD display with 270-degree swivel and the built-in video light/camera flash further aid in getting just the right shot. The DNV16HDZ captures vivid HD video in 16:9 widescreen format (1920 x 1080p) with a frame rate of 30fps and H.264 compression. Take quality photos or video in the dark with night scene mode and or with infrared night vision; even the darkest images will stand out in stark contrast. Experience the best in entertainment with MirageVision outdoor TVs built by experts. This MirageVision Gold Series 65-inch HD television features an LED enhanced back-lit screen for increased brightness outdoors and one of the highest dynamic contrast ratios (6,000,000:1) on the market. This HDTV features crisp, 1080p resolution, and an active matrix liquid crystal display for enhanced brightness. Ambient light technology automatically adjusts the image to adapt to changes in outdoor lighting conditions. All MirageVision televisions are top name-brand TVs, such as Vizio, Sharp, and Panasonic, that are customized to suit outdoor weather and temperatures. The TV will withstand sub-freezing weather and temperatures up to 145 degrees Fahrenheit. A special Teflon UV-coat is applied to the sealed enclosure to protect the moisture-resistant internal circuitry from dust and bugs, while the adjustable, water-proof nylon cover protects inputs and outputs. Rear cabinet RainGuard technology allows internal hot air to escape, while repelling rain or snow to prolong the life of your TV. This all-weather TV comes complete with a remote, tabletop stand, and back panel wall mount holes. Each MirageVision TV is custom-altered for the outdoors and appearance may vary from what is pictured. The manufacturer requires the use of a surge protector with their products for the warranty to remain valid. With supercharged performance and stunning full frame high-resolution image capture the Canon EOS 5D Mark III is designed to perform. Features include: 22.3 MP full-frame CMOS sensor 14-bit A/D conversion wide range ISO 100-25600 DIGIC 5+ Image Processor 61-Point High Density Reticular AF iFCL 63-zone dual-layering metering High-Speed Continuous Shooting HD Video with manual exposure control magnesium alloy body with weather sealing Self Cleaning Sensor Intelligent Viewfinder Multiple Exposure Control 3.2 in. TFT LCD Monitor High Dynamic Range and much more! NA Flatscreen Televisions Wall Mount 36 - 50. Universal bracket for 36 - 50 Televisions. Level gauge built-in for easy install. Anti-theft and anti-tamper lock positions. 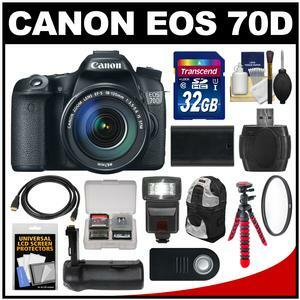 The Canon EOS 70D is a powerhouse DSLR camera featuring Dual Pixel CMOS AF technology that unlocks the potential of Live View. This game-changing technology allows the EOS 70D to capture video in Live View with smooth and precise autofocus similar to that of a camcorder complete with the superb image quality that is a hallmark of EOS cameras. Additional features include: Vari-angle Touch Screen 3.0-inch Clear View LCD monitor II; Built-in wireless technology; 20.2 Megapixel CMOS (APS-C) sensor; DIGIC 5+ Image Processor; continuous shooting up to 7.0 frames per second; extended ISO range of 100-12800; 19-point all cross-type AF system; HDR Backlight Control; Multiple Exposure; Handheld Night Scene; Creative Filters; and much more! This outfit also includes the EF-S 18-135mm f/3.5-5.6 IS STM Zoom Lens. Experience the best in entertainment with MirageVision outdoor TVs built by experts. This MirageVision Diamond Series 70-inch HD Smart television features an LED enhanced back-lit screen for increased brightness outdoors and one of the highest dynamic contrast ratios (8,000,000:1) on the market. This HDTV features crisp, 1080p resolution, and an active matrix liquid crystal display for enhanced brightness. Ambient light technology automatically adjusts the image to adapt to changes in outdoor lighting conditions. Diamond Series TVs offer the best in entertainment with built-in WiFi, pre-loaded applications, and optional 3D with glasses. MirageVision televisions are top name-brand TVs, such as Vizio, Sharp, and Panasonic, that are customized to suit outdoor weather and temperatures. The TV will withstand sub-freezing weather and temperatures up to 145 degrees Fahrenheit. A special Teflon UV-coat is applied to the sealed enclosure to protect the moisture-resistant internal circuitry from dust and bugs, while the adjustable, water-proof nylon cover protects inputs and outputs. Rear cabinet RainGuard technology allows internal hot air to escape, while repelling rain or snow to prolong the life of your TV. This all-weather TV comes complete with a remote and back panel wall mount holes. Each MirageVision TV is custom-altered for the outdoors and appearance may vary from what is pictured. The manufacturer requires the use of a surge protector with their products for the warranty to remain valid. 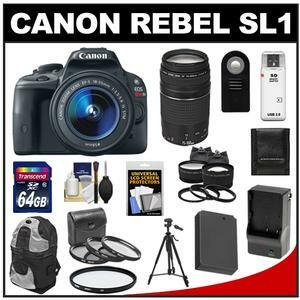 The Canon EOS Rebel SL1 is small in size but enormous in performance. It features an 18.0 MP CMOS sensor ISO up to 12800 DIGIC 5 image processor continuous shooting up to 4 fps Full HD movies (1080/30p) 3.0-inch touchscreen LCD display Hybrid CMOS autofocus system Scene Intelligent Auto Mode Optical Viewfinder Creative Filters and much more! 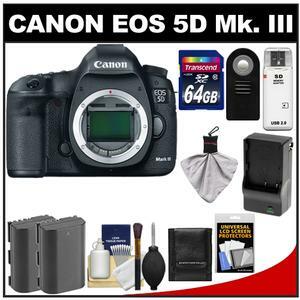 Included is the Canon EF-S 18-55mm f/3.5-5.6 IS STM Zoom Lens. 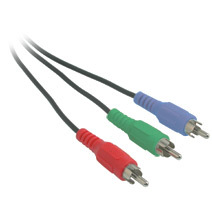 Value Series Component Video Cables are the ideal choice for connecting high definition DVD players and high-end televisions. These cost-conscious cables are high quality and deliver a crisp clear picture for less. The cable s shielding helps reduce unwanted noise and distortion. Nickel plated connectors ensure long lasting corrosion-free connections to your equipment. The color-coded molded connectors attach to an ultra-flexible jacket allowing for easy installation and identification. Component Video Cables are able to bypass the TV s Y/C separator and color decoder routing the color (Y Pr Pb ) information directly into the TVs matrix decoder. By sending the pure DVD component video signal directly to a component video input-equipped display device the DVD signal forgoes the extra processing that normally would degrade the image. The result is a vastly increased image quality with incredibly lifelike colors and crisp detail. Connectors: RCA Plug x3 to RCA Plug x3. Ultra-flexible jacket for easy installation. Fully-molded connectors provide excellent strain relief. Provides video signal transfer between DVD players and televisions or projectors. Color-coded connectors: Red green blue. For Flat Panel Televisions 36 - 55. Solid Heavy Gauge Steel Construction. Supports up to 165 pounds. Easy to Install Mounting Hardware Included. Samsung Galaxy Note ® 10.1" Wi-Fi 16GBThe ultra-sleek Galaxy Note ® 10.1" 2014 edition has great new features like Brilliant Display, Intuitive S Pen, Do More with Multi Window® and Amp Up Your Downtime.